JawsDB is a database-as-a-service provider that offers three different types of databases, namely, MySQL, Postgres, and MariaDB. With a one-click provision through Manifold, you can avoid the slow, repetitive process of setting up relational databases. JawsDB ensures that you will get a server for yourself and that only you will get the root credentials to your server. In addition to that, JawsDB creates automatic nightly backups and replicates your data across different regions in the world. You can also create, edit and save reusable queries against your server, providing a custom reporting solution for your database. 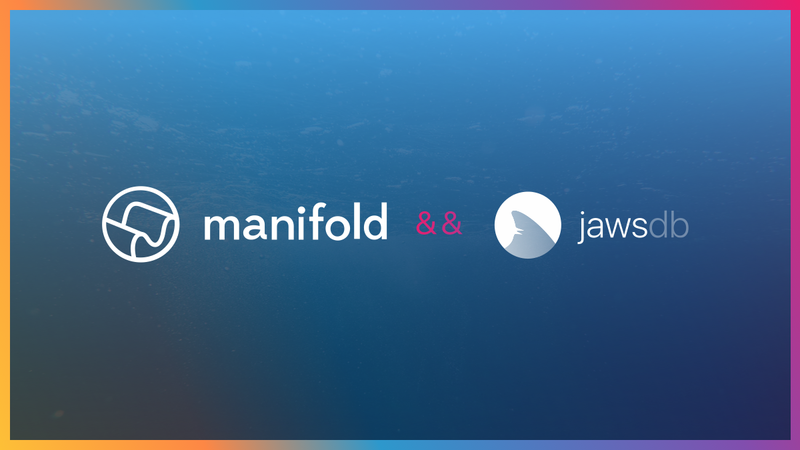 JawsDB launched as a standalone database service in May 2017, with early access through Manifold. We reached out to John, creator of JawsDB, to learn more about his story and what he’s offering. Sitara: What are a few key differentiators between the three types of databases you provide? John: Currently, we’re offering managed MySQL, PostgreSQL, and MariaDB databases. At a high level, you can think of MySQL as the pragmatic option due to its large market share and focus on speed and utility. While capable of handling data and apps of any size and type, read-heavy applications with simple individual queries excel here. Postgres is an engineer’s database, and I mean that as a complement in that it focuses on doing things the ‘correct’ way. It is much more compliant with ANSI SQL than MySQL and has wonderful support for GIS data, special datatypes, and stored procedures/routines. MariaDB began as a true open-source fork and drop-in replacement for MySQL when MySQL was acquired by Oracle. Since then, it has diverged and innovated in several ways. An example of this is Maria’s fantastic JSON functions and features. S: What made you pick these three over other RDBs? J: MySQL was an obvious choice for me. Not only is it consistently ranked as the most popular open-source database, but it was the database that I and many others like me cut our teeth on when we were first learning to program. The concept of the LAMP stack (of which MySQL was the ‘M’) was incredibly exciting as a student developer as it allowed a team of one to play on the same field as large companies. Postgres has stepped into that role as well, thanks to tireless evangelists and the fact that Postgres, frankly, is everything it is hyped to be. It’s simple enough for the beginner; it’s fiercely compliant for those who like to get the most out of the SQL; it’s powerful enough for the large orgs and heavy workloads; and it is practical enough for small businesses and simple web applications. Like many, I was nervous when Oracle acquired MySQL so the MariaDB fork was something I started following closely. While many of my fears about the Oracle acquisition were thankfully put to rest, MariaDB had begun to add its own unique features and improvements that make it a worthy choice for anyone looking for an open-source RDBMS to use. S: How do you think RDBs are changing as the quantity of data increases exponentially? J: Over the last few years, RDBs have put a lot of effort into JSON, both by supporting it as a binary datatype, and by providing functions designed to query it efficiently. The aim is to provide Document Store functionality alongside the existing tried-and-true relational foundation that each is built on. The benefits of this approach are many, as a single database engine can tackle a wide array of challenges facing a company looking to handle relational data as well as large amounts of unstructured data. There will of course be instances where the horizontal scaling capability of a pure document store will lend itself better to certain workloads, but these RDBs have done a great job of offering options to customers who want to benefit from a document store in addition to reliably handling their relational data. S: Postgres has evolved a lot over the last few years, do you see any other significant updates on the horizon? J: I’ve worked a fair amount with SQL Server in the past and one of my favorite features was the ability to selectively replicate data to the secondary server. Postgres, by contrast, uses a replication system that necessarily copies the entire database bit for bit to the secondary server. Now, in version 10, Postgres is adding “Logical Replication” which will allow much greater control over what is replicated between a primary and secondary server. Not only that, but tables downstream of the primary server can also now be indexed differently from the primary. This is incredibly helpful when using a secondary server for reporting purposes or for queries different than what would be sent to the same data on primary. Version 10 brings many other significant updates, but I gotta say that logical replication is the one I’m most excited about. S: Are relational databases here to stay? J: For the foreseeable future, I will say: definitely! It’s easy to get so excited about the innovations in non-relational space that one forgets how much data out there is still best suited for relational databases. Structured and transactional data is necessarily found in nearly every industry. RDBs still excel with this data. Big data and the knowledge we can extract from it are downright exciting, but that structured transactional data will remain. It’s also worth noting that an unfathomable amount of existing code has been developed with RDBs and SQL at their heart. These include CRM and e-commerce applications, blogging platforms, BI tools, etc. The absolute ubiquity of RDBs and applications that require them will alone ensure their continued dominance for years.